Yes, she said, she’d moved on to other and better things and had been leading a rich and enjoyable life ever since. But it was apparent that Jane hadn’t moved on in her life. She still couldn’t let go and talked about it to anyone and everyone who’d listen. How they’d overworked her. How the responsibility had weighed her down. How she’d worked so hard for them over the years. How the demands and pressure of the job had got to her in the end so she resigned. And how her loyalty hadn’t been appreciated. Now, nearly twenty years later, it was still unfinished business for her. And, from what I gathered in speaking with her and observing her interacting with others, she will still be reliving the disappointment in a further twenty years’ time. It’s sometimes difficult to put things behind us and just move on with our lives. Sometimes a memory acts like a ball and chain and holds us back - because we relive it over and over again. The trusted friend or lover who betrayed you. 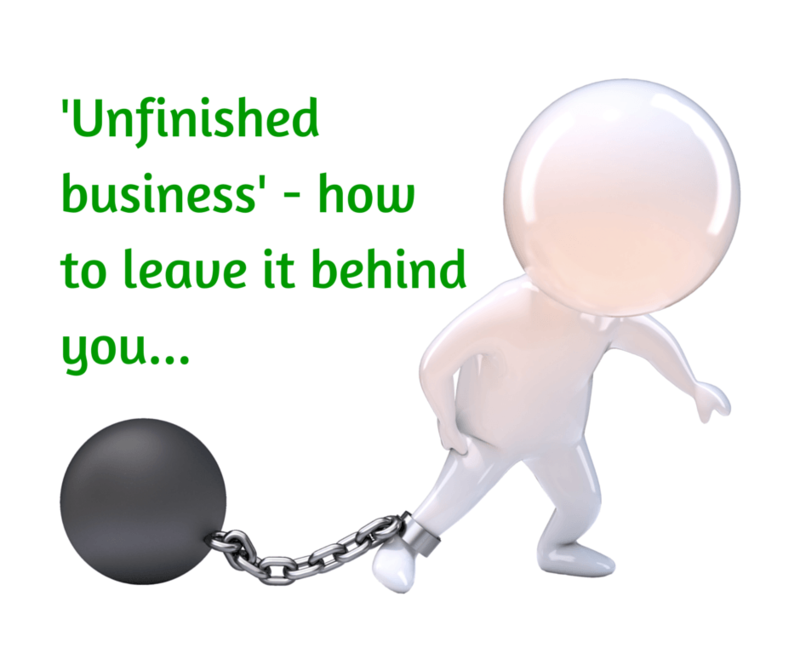 Unfinished business eats away at our peace of mind. We keep going over and reliving those unpleasant or uncomfortable events as if this might finally free us from them. In fact, reliving a memory actually strengthens that memory. The more we relive those unpleasant events the more powerful we make the memory. The unfinished business list can be endless. And it can be added to daily, simply because we human beings are fallible. We don’t get it right all of the time. And neither do the people we encounter in our lives. And this includes the people we are very close to. The recent newsletter ‘Leave it by the River’ suggested we develop the habit of moving on - and leaving the past in the past instead of dragging it with us. A lot of people liked the idea – in principle – but asked ‘how exactly can I leave it by the river?’ And, yes, the article was a bit short on step-by-step instructions. So here are 4 practical steps to Leave it by the River. Step 1: Can I take action? Before you put the memory behind you make one final check. You want to ensure you’re wiser for having gone through it – even if it wasn’t your fault. Do I need to speak to the person involved? Usually if another person was involved it’s probably best to leave it be and move on with your life. They’ve probably already done this! Decide to cut your losses, put it down to experience, and move on. Do I need to do something about myself? Take a good look at your role in the situation. Ask yourself If I could go back and do it again what would I do differently? Now check if you’re already doing these things differently in your life today? And, if not, it might it be a good idea to now begin changing how you handle such situations? Once you’ve used the memory to adapt your way of handling similar situations today you’re ready to put it behind you and move on. Step 2: Decide to leave it by the river! Now for the easy step. You decide I’m not going to carry this with me forever – enough is enough! Yes, it’s an easy step. But it’s not enough. Why? Because at this stage you’re simply mouthing a few words. It’s a bit like old-style affirmations. Without attaching emotions to the decision it won’t have much effect. That’s the next step. What will happen if I don’t leave it behind me? What will my daily life be like if I continue to carry this with me for another few days? Or another few weeks? Or years? What will happen if I do leave it behind me? What will my daily life be like if I take action right now – to free myself from this memory forever? As you consider the questions mentally ‘step into’ each of these scenarios and feel the emotions. This will support your decision to free yourself from this piece of unfinished business. Doing this will ………………………… (fill in your own motivator). No, not that thought – THIS one!! And when you add NLP to conventional Thought Switching it becomes quicker and more enduring. The NLP Swish Technique is a well-known example of this process. To switch from one line of thinking to another you need to have your Replacement Thought prepared in advance. To do this think of how you want to be going about your daily life – alert, vital, positive, at ease, confident, etc. This is your Replacement Thought. And it’s worth preparing a really appealing Replacement Thought - the more attractive it is the more effective your Thought Switching will be. This is a simple five-minute mental exercise. You can do it with eyes open although most people find doing it with closed eyes makes it easier to focus on what you are doing. (3) Have your mind go blank or, better still, open your eyes and look around you. Round 2 is similar but quicker. (3) Blank your mind – or open your eyes. Now repeat Round 2 four or five more times. Do it a little quicker each time - till the switching takes just one second. Make sure you ’linger’ on the Replacement Thought for a few seconds. Be sure to blank your mind or open your eyes between each round. Note; This Thought Switching can work for quite big issues as well as little ones. However it unlikely to be useful for traumatic memories or very powerful ones and these are generally best resolved with professional guidance.